1. 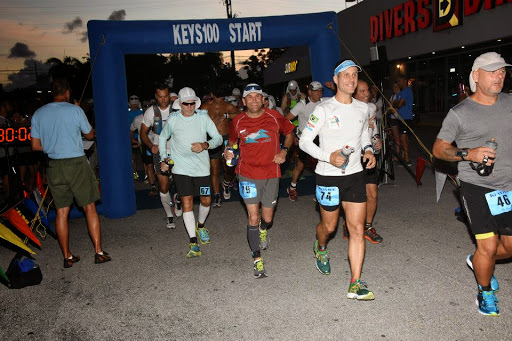 The Keys 100 was the first race of my life. 2. It was my first attempt at a 100 miler. 3. This is the first report I’ve written–so bear with me. It had been a long journey to reach the starting line of this race. I had a very typical backstory of a former school athlete (baseball in high school and into college) who eventually started his career and got more and more out of shape. By the time I hit age 31, I was tipping the scales at 226 lbs (101 kg) and I’m only 5′ 8″ (173cm). When it finally hit me, by way of the scale combined with a mandatory physical for a new job, that I wasn’t even overweight but obese, I had a moment of truth in which I knew I had to do something about my situation. Somehow I knew that running was the quickest way to get back in shape and lose weight but I couldn’t even run more than 10 minutes at a time. I joined a gym and put in 4-5 days a week of walking and jogging on a treadmill along with weights, elliptical trainer, and stationary bike. At the end of two years, the longest I run I did was a half marathon on a treadmill in about 2:20. When I moved to a new location for work, I no longer had a gym membership but instead tried my hand at running outdoors. That was a huge change from only treadmill running. I quickly found out that I couldn’t run more that 2 consecutive days without bad pain in my knees. I also encountered the dreaded IT band syndrome from running on many hills. I had to stop running for 2-3 months and just cycled instead. I eventually started running about 3 days a week with about 3 days of cycling but another move for work along with a lack of focus meant the training dropped off, the weight started creeping back and I wasn’t generally happy about it. 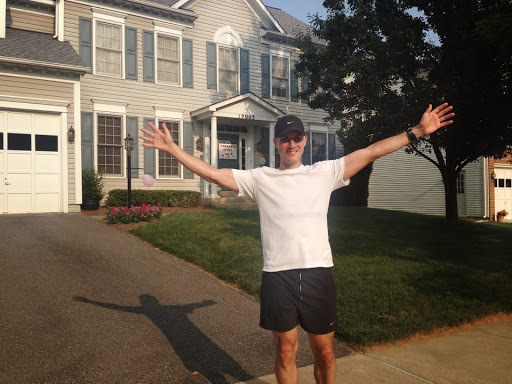 Then a miracle of sorts happened in June of 2012 — I challenged myself to running every day of the month. However, I did some research prior to starting this goal. Thank goodness for Google! I found out that what I was previously doing was pushing too hard too fast–so common for runners. I learned that if I limited myself to a pace just above a fast walk and didn’t do it for anything more than 30 minutes, I could start to acclimate my entire body and not just my cardiovascular system. The bones, cartilage, ligaments, and connective tissue take quite a bit longer to adapt to a heavy workload like running demands. My method was to only do 30 minutes or 3 miles, whichever came first and to do it a super slow pace (think slower than 10 minute miles or 6 minute kilometers). The first two weeks were a bear but I am one stubborn person when I am challenged with something or someone tells me it can’t be done. After persevering through aches, pains, and niggles but nothing major, the problems subsided. By the time I hit week 4 I felt like a changed person. I accomplished my goal and ended up running for 6 weeks without a break. Over the next several weeks I slowly increased my weekly distance with an occasional 8km run, then 10km run, and eventually by August I woke up one morning and ran a half marathon as a training run just for the fun of it. At the end of August I attempted my first marathon distance on my own and did it. Yet a funny thing happened when I finished the marathon distance, I felt like I could run farther. Again I went to the Google machine to search for “Longer than a marathon”. Lo and behold, the term I had never heard of before popped up: Ultra Marathon. Very interesting, I thought. The research continued. I read about amazing distances and the prototypical ladder of ultra marathons (50km, 50mi, 100km, and 100mi). I thought 50km is doable but the rest are ridiculous and probably not going to happen. I went to work training for a 50km run. I set my sights on January 2013 and trained throughout the fall. I even ran another marathon distance in December 2012 just for mental preparation. On MLK day in January I set out on the road and ran 50km in and around Luxembourg City in subfreezing temperatures with 3-5 inches of snow on the ground. After 5 hours and 20 minutes, including time to eat and adjust equipment, I finished. The last 45 minutes were a death march (I didn’t know that was the term at the time) but something inside of me said there’s no way I’m going to stop after completing more than a marathon. If I stop now, I’ll have to run all those km/mi over again just to have a chance to finish 50km. I pressed on and did it. I reached my home and collapsed on the floor. The running continued throughout 2013 and by May 2013 I completed my first full year as a real runner. I had a light June and July with training and only averaged a few days a week of running. By the end of the year I was running more but not with a real focus on any goal. When Christmas hit and I was starting to see weight creep back on (I reached 182 lbs after getting down to 170lbs), I knew I needed to challenge myself again. Let the research begin again, I thought. Looking back on my training logs via Garmin’s website, I looked at my patterns and what made me successful in 2012. I committed myself to a run streak of the month of January 2014, kept a strict food/calorie log, and plugged away. In the meantime I figured out a new goal–I decided I was going to run across the country of Luxembourg. For those that aren’t familiar with the country, don’t get too impressed. My path I chose, from Belgium, across Luxembourg, crossing into France, returning to Luxembourg, and ending in Germany, was only 39 mi/63 km. Yet it seemed like a good goal. Run 39 miles prior to my 39th birthday. Over the next few months I slowly upped my weekly distance and increased my long runs. I did a recon mission by bicycle tracing the path I’d run on foot. In May I embarked on my journey and successfully crossed the country running with no walking whatsoever. My incredible wife even paced me the last 25 kilometers. I crossed the German border after 6 hours and 22 minutes of running. With that goal out of the way and knowing how I operate, I knew I needed a new goal. What was next on the ultra ladder? 50 miles…um, okay but that’s 80.5 km I thought. It’s only 20km from a 100km so I said what the heck I’m going to do 100km in the summer of 2014. I plodded away at my training and was starting to run over 100km/60mi weekly prior to my 100km attempt. At the time of my attempt, I had moved from Luxembourg and was visiting my family in the Washington, D.C. suburbs. I plotted a course that would have me run from the very beginning of the Rock Creek Park to the Potomac River in D.C. and back. The last portion of the run would even take me past homes where I used to live, schools I used to attend, neighborhoods where I used to play with my friends, and baseball fields I used where I used to play. The theme was a literal trip down memory lane. I felt good 3.5 hours in. The 100 km endeavor was a reality check and a big piece of humble pie. I’ll cut to the chase by saying I completed it but I was finally hit head on with a firm dose of reality in ultrarunning, you cannot run the whole thing. By hour 6 of the run, my quads were starting to tighten up and as I approached hour 7 I could barely maintain any sort of pace. I met my incredible wife at a predetermined location as a makeshift aid station and told her that she may need to start accompanying now because I’m not sure I am going to make it. I had completed just shy of 70 km of the 100 but there was no more running left in my legs. We were supposed to meet at km 80 to finish out the route. After some good pep talk and me swallowing my pride, I decided that if I had to walk, I had to walk, but by golly I was going to finish this 100 km. We walked for 45-50 minutes and I told her I’d try to run a little bit to see if my legs would respond. Amazingly enough, they did! From that point on I did intervals of about 20 min of slow running with 5 min of walking. We did that until 12 km remained and I gutted out the remaining distance by running straight through. I even got near 10 min miles during that stretch. After just under 13 hours I had completed the 100 km. Now there was only one thing left for me to be fully self validated (at least in my mind) as an ultrarunner–the incredible 100 miles. In September of 2014 we arrived to our new home in Mérida, México. I had always wanted to live in México because my wife is from the country. However, I had no idea that Mérida was so different compared to Luxembourg in terms of outdoor sports. It is 100% flat, there are barely any usable sidewalks, and ZERO trails. It’s all street running. 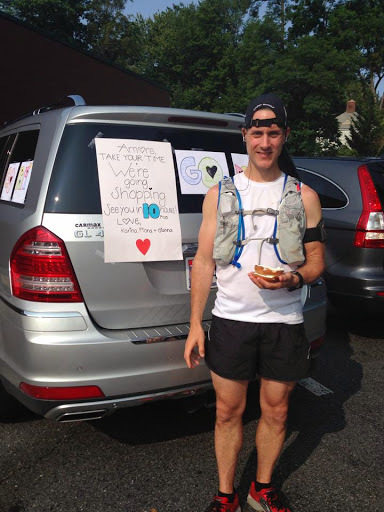 I trained for about 2 months but hadn’t committed myself to a date for doing my 100 mile run. For reasons unknown to me and probably because a friend signed up for the Marine Corps Marathon in November 2014, I reconsidered my longstanding view about never wanting to enter a race. I had various negative reasons for not running in a race including, self-doubt, not feeling like I belong, and fear of failure. Yet the overarching reason I ran is because I liked to run. Running is my active form of meditation. Running is what challenges me to push myself beyond where I may be today. I have always had a strong competitive gene in my body since my first waking memory. I think it’s why I did so well in baseball as a kid. As an adult I found that running is my outlet to find out what I can truly accomplish. I haven’t found my limit yet but I’ll keep trudging until I do. Back to the signing up for a race idea…I decided I would find a 100 miler because I just couldn’t see asking my wife to follow me around the Mexican countryside by herself for 24 hours just so I could accomplish my self-imposed goal of 100 miles. Logic told me that I should find a race that matches the terrain where I live and the weather. 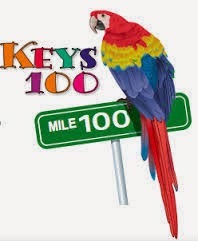 That led me to the Keys 100 in May 2015. It was further away on the calendar than I wanted because, being the impatient person I am, I preferred to do the attempt in late February/early March. In the end, that was a blessing in disguise because it helped me iron out a few training issues as well as build my conditioning to a better level. I tried to remember to smile as much as possible. When I arrived to Key Largo and attended the pre-race packet pickup/meeting, the butterflies started to hit. I felt really out of place, knew nobody, and wondered if I belonged amongst all these fine athletes. Race Director, Bob Becker, went through many details of the exchange points, route, aid stations, and rules but after about 10 minutes everything just started blurring and for those that are familiar with Charlie Brown, I just started hearing his teachers speak. Following recommendations, I slept well Thursday night but Friday night I only slept until 2:45am. I got everything ready in the hotel room and started packing everything in the minivan. My wife, two daughters, and mother-in-law were accompanying me on this trip. 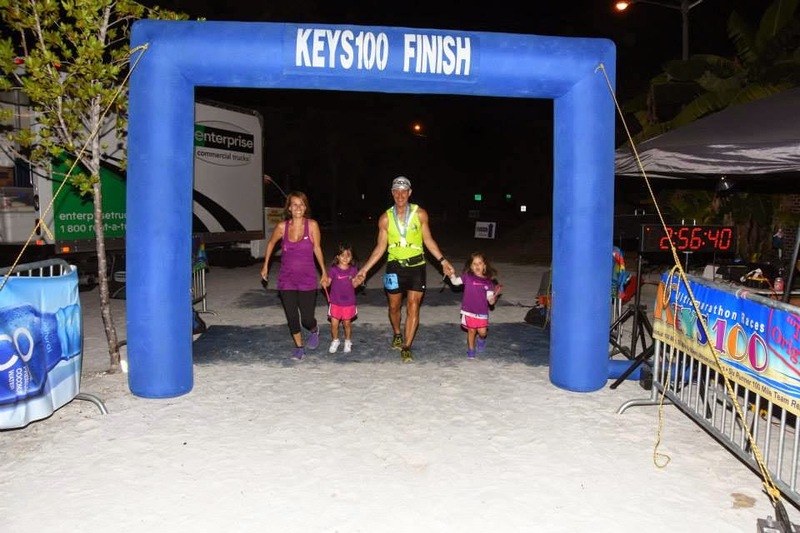 All would be in the vehicle for the first 10 miles of the race, then my wife would transport them to Key West, drive back to find me on the course and crew for me the rest of the race. Did I mention she is 7 months pregnant? While loading the minivan, I dropped one of the big suitcases on my left ankle. OUCH and why wasn’t I more careful? Was I self-sabotaging just hours before things were set to go? We got the whole minivan loaded up and headed for the start area at around 5am. We waited around at the start line, took pictures, saw all the pre-race rituals of the runners, and finally the opening ceremonies including the national anthem took place. Now the goosebumps were arriving. I was in the 4th heat of the individual runners which meant I got to watch the first three waves of runners who either said on their entry form they would finish under 21 hours or had run that fast in past events. I had to fight more self doubt by entering in chatter with other participants to pass time. Finally my wave was called and I entered the corral. Mike Morton, the official timekeeper of the event said his little jokes to loosen the tension, counted down the time, and boom…away we went. My method I used was heart rate based using data that I had captured over the past couple years of running. I wouldn’t let my heart rate climb above 130 for the first couple hours then would use 140 as a limit as the temperatures rose. Unfortunately due to my adrenaline, my heart rate was already elevated so I had to readjust to keep my heart rate in the low 130s to start. It still frustrated me because even at around 135 I was only running at a 6:30-6:40/km pace (approximate 10:25-10:35/mi). This was quite a bit slower than I normally run at that heart rate in equivalent temperatures and humidity in México. Yet I resisted the urge to push myself yielding to the advice of so many other runners and books I had read. The first 45 minutes flew by thanks to the fact there were so many runners around. I ended up meeting a very nice guy from Florida named Issie who had run this race before. He commented on my shirt that my wife had designed that said Te Amamos Papá (We Love You Papa). He was a Latin American immigrant and thought it was cool that I had that on my shirt. We exchanged quite a few stories and at the 45 minute mark he pulled up to start his intervals. I pressed on and met back up with another runner I met the day before in the pre-race meeting named Butch. He was a strong runner who had a running background from high school and was part of an ultrarunning team at Virginia Tech. He was also 20 years my junior!! We, too, talked quite a bit and exchanged our running strategies but at mile marker 91.5 (it counts down from 100), the parking area was on the other side of the road from us and my family was still in the car. I didn’t want them to get confused so I wished Butch well and went across to tell my family to go to the next exchange point. At first mandatory check-in at mile marker 90.5, I met my family, got two full bottles of tailwind mixed in water, and said my goodbyes since my daughters at ages 4 and 3 would not last throughout the long day and night of running. My wife took them to Key West and I wouldn’t see my wife for another 5+ hours. I had no idea how much that would affect me. At this point I was running by myself but with runners within view in front and behind. We were off the main Route 1 on a service road. It had high trees and was kind of picturesque in a non-Florida/ocean sort of way. I still felt very good but was not running as fast as I wanted. My first bathroom urges were hitting me but I was having a bear of a time figuring out where would be a good location. Luckily there was a construction site which meant port-o-potty to the rescue. I was in and out in under 60 seconds and I felt much better. Over the next few miles there were various crew cars meeting runners which made me think what exactly I needed to do for my strategy. I had two 16 oz bottles. I held one in my hand and had a hip pack with a holster for the other. I also carried 4 packs of tailwind (1 per bottle) and one almond nut butter. By 8:30am it was pretty darn steamy. My experience from training in 103-108 degree F (39-42 C), made me drink lots of my tailwind concoction. I was finishing nearly 2 bottles an hour from hours 2-3. At mile marker 85.1, I filled up my bottles with more ice and water as needed. I set my sights on the next full aid station 5 miles away. By the time I hit the full aid station, my heart rate was definitely way too high and I knew right away I was starting to overheat. I checked in, filled my bottles with water and tailwind and plodded away. I was getting more and more sluggish and knew something wasn’t right. My feet were sloshing like I was running in the rain. My left big toenail hurt a bit and I was reaching heart rates in the 150+ range. Just after hour 4, I already had to take a one minute walking break. This was not my plan coming into the race. Based upon a 50 mile training run I did at the end of March, I wanted to run for 7-8 hours prior to walking. Also based on that run, which was done in harsher conditions than the Keys 100, I had set my goal of finishing the 100 miler in under 20 hours. I knew that was in definite jeopardy if things didn’t improve. Again drawing on the advice of other expert runners and my experience, I knew it was more important to slow down now and get my body in check, rather than running the risk of completely blowing up before the halfway mark. While I did slow down and start mixing in some walking, I had another huge problem. My stomach was feeling bloated and foamy. I did some analysis of what had transpired and I quickly realized that I had been drinking only my Tailwind mix without any pure water. Because of the heat and nerves of the race, I had overloaded my stomach with this solution and my stomach was revolting. To summarize, I had feet that were squishy and sliding forward in my shoes, I was overheating, behind the pace I wanted, and had stomach issues. EXACTLY what I wanted without even completing 25% of the race!!! As I moved along slowly towards the 25 mile timing check-in, I saw how far behind my desired pace I wanted–at least 20 minutes. Not good at all. Like I said, my plan was for the 20 hour mark. My idea was to run the first 50 miles in around 9 hours to give me 11 for the second half. That was a two hour buffer that I had already eaten into during my first 25% of the race. Frustrating but I didn’t let it get me down. I knew there was a lot of distance to cover and I made the decision then and there, I would just give it my all, but stay conservative. I wouldn’t give up and just walk. I would moderate my pace so I could run the majority of the route. After that check-in I was in interval mode doing 5 minutes running, 1 minute walking and sometimes I’d skip a walking interval depending on my heart rate and how I felt. 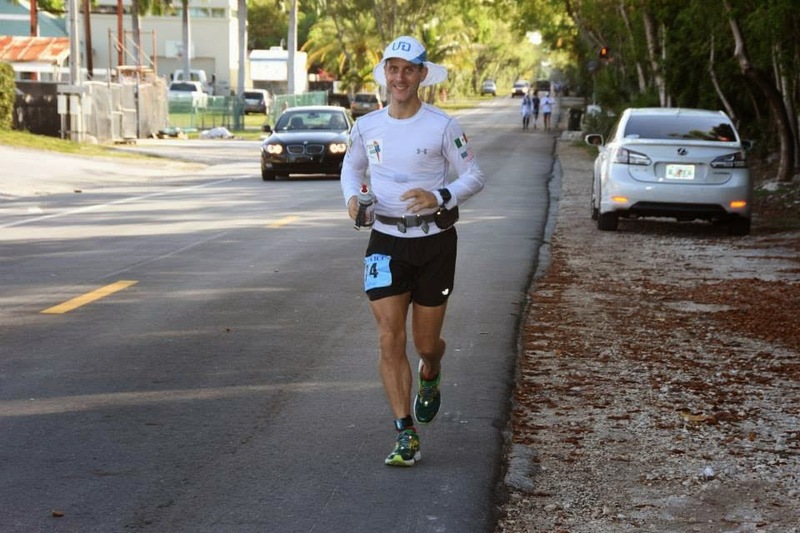 Along the way I met a nice runner named Hernán who saw the four flags on my shirt–one being from Brazil. He asked me if I lived there, and I said to him (maybe in my broken Portuguese) that I lived there for a couple years. Then in English I explained to him the flags represented my family. A Brazilian and Luxembourgish for my two daughters, a Mexican for my wife, and an American for me. We chatted when our intervals matched up and he told me he had done the race before but today wasn’t going well for him. He said he wouldn’t finish. I tried to be encouraging but he seemed pretty resigned to his fate. On a side and at my great delight to see, he did finish the race. Good job man! He gave me some advice on not pushing too hard and being careful for the Hell’s Tunnel portion which was a long stretch through stagnant air and mangrove. It was known for just cooking the air. I bid him farewell as our intervals didn’t match up any longer. Eventually I reached the 70 mile marker (30 miles into the race) and was running by myself again. I was still too hot and was really looking forward to finding the next water station so I could fill one bottle with water and one with Tailwind to help find a balance for my stomach. Finally in a little less than 2 miles I found the check-in and access to more water. At this point I had been redlining–and it really sucked. My modified approach from this moment was to try to balance the water and tailwind solution to make sure I kept the water and calorie intake without bloating my stomach. I ended up running for more than an hour with cramping, bloating, and burping foam. YUCK! In the time after my family’s departure I figured out that I needed to focus on getting between the “Cooler” (water/ice) stations and the full aid stations. They were roughly 5 miles apart. However, I ran into a bit of a let down when I approached twhat was supposed to be Cooler before the Long Key. There was a sign but no cooler. UGH! Now I was running with low amounts of water and the remaining water was the temperature of the air, which was now in the upper 80s. While running on Long Key, I received a phone call that my wife saying she had returned and was near. She’d meet me on the other side of the bridge I was on. Relief was in sight…or was it? I got to the other side of Long Key bridge, saw a bunch of support vehicles but no wife. Now it was time to cue the pity party music. My phone, which was not a US phone and didn’t have much airtime to work in the US, received a call from my wife but in my sweaty fumbling I couldn’t get the call. I tried to text but it failed. Little did I know that I also sent one of those automatic texts on an iPhone that said, “Can I Call Later?” or something to that regard. With that, my wife didn’t call back. Luckily, which happened many times due to the huge generosity of the fellow runners and crews, another group saw my despair and filled up my bottles with what I needed. About 15-20 minutes later I found my wife at the mile marker 59 check in (40 miles into the race). From this point on, I would have my wonderwoman of a crew known as my wife helping me the rest of the way. I was definitely rescued in more ways than one. We proceeded to meet each other at each of the designated runner/crew exchange points every 1-2 miles. After the first exchange I entered Hell’s Tunnel. That was not fun at all. It was everything Hernán described. Hot, dreary, non-moving air, and I tell you it felt slightly uphill the entire time. I think it lasted 20-30 minutes but felt like more. Over the next 5 miles leading up to the halfway mark, it was pretty standard going. I’d run and mix in small one minute walk breaks here and there and meet my wife. I wasn’t in terrible shape anymore, nor overheating due to always having ice in my hat and ice in my bottles. However, at one of the stops before the halfway mark I decided I had to change my shoes because of the pain emanating from my big toes–especially the left one. When I took off my shoes and socks I saw disaster. Both of my big toenails were raised up and the one on the left was a good quarter of inch raised. Looking back on things I should have punctured the blisters right away, treated/tapped them and moved on but in my rush and inexperience, I just put on fresh socks, changed to my Hoka shoes with a bigger toe box and moved along. My feet were in a lot of pain but this race turned into me just blocking the pain out to deal with at another time after the race. 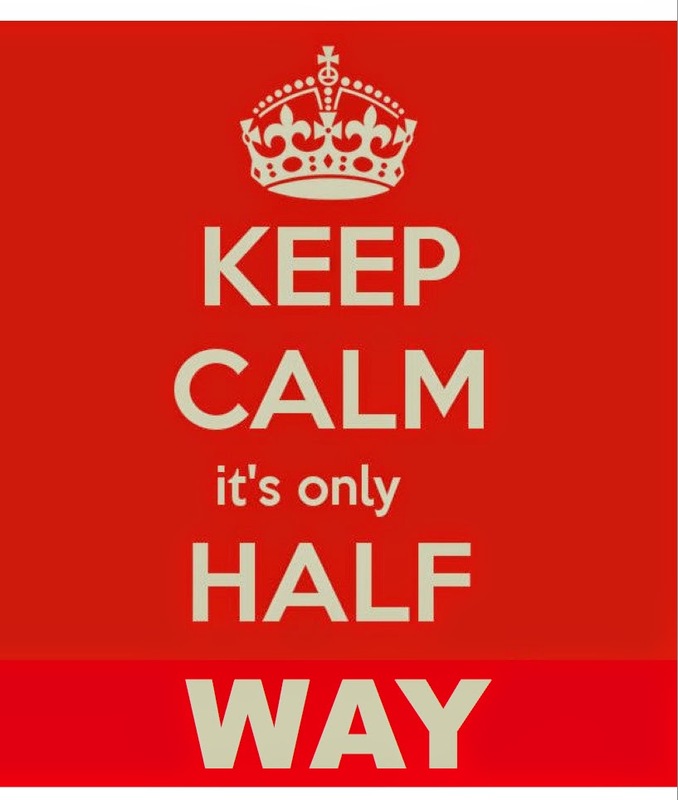 We reached the halfway mark at the 50 mile check-in in Marathon and my wife displayed another one of her many awesome posters, “Keep Calm, It’s Only Halfway!” When I checked my time I realized that I was 45 minutes behind the pace I wanted to keep. Reaching my sub 20 dream goal was just about lost but I refused to give up or just phone in the rest of my race. I told myself that I was going to do as well as I could no matter what and let the chips fall where they may. The first target was the elevated portion of the 7 mile bridge. I decided I needed to run to that point and then I’d walk the uphill portion. While running on this bridge I was passed several times by Butch, another strong runner Michael, as well as this runner that ran the entire race in sandals. Their running paces were far stronger than mine. Yet when we reached the uphill portion of the bridge, my faster walking pace put me ahead of them again. Near the top of the bridge I started running again and used an interval of 5-11 minutes of running to one minute of walking. After about 80-90 minutes I reached the other side of the bridge and so happy to see my wife. We were now 60 miles into the run and sometime during the next 5 miles I crossed into new territory for my running career: I surpassed 100km (roughly 62mi). Around sometime between mile 60-70, it started to get near dusk and I switched from the desert gear of a long sleeved white Under Armour tech shirt and Ultimate Direction desert hat with the neck flaps to a tank top and regular hat. I also donned my mandatory reflective vest with flashing LEDs. Very quickly I realized that I needed to use my Petzl headlamp as the main road didn’t have many streetlights in certain sections. As a side note, since I live outside of the States, I do all my calculations of pace, distance, etc. in kilometers. From the 100km mark I had about 61km to go. My thought process was to get through km 100 to 120 and then the rest should be downhill. My thought process, as weird as it may be, was that any of my training runs on a given week would be in the 10-40 km range. If I could get my distance down to that range, I could mentally process it as “just another training run” and not some giant distance. During miles 70-80, there were several routine exchanges between my wife with the exception of one almost fatal mistake. At around the 78 mile mark there was a pedestrian bridge closed right after an exchange point. I had switched my Garmin watches because for some reason the one I had been using was near the end of its battery life even though it was supposed to have had 24 hours of life. (After the race I figured out that I left wifi running on the watch and how to turn on UltraTrac mode to give it near 40 hours of life–would have been nice to know beforehand!) While messing with the backup watch, I kept walking forward on the pedestrian path until coming head on with a fence and seeing it was closed. Now I could have gone back the 200 meters to where I met my wife and gone up to the road but I looked up a small embankment and though I’d just go up, hop the guardrail and be on my way. Unfortunately, when I swung my right knee over the guardrail, I smacked my kneecap dead against one of the wood and metal posts. For a moment I thought my day was over. I got over the guardrail, had blood dripping down my leg and could barely walk, let alone run. To recap: The sole of my left foot was badly blistered due to over lubricating it with aquafor–which I had never done before, both of my big toenails were lifted up due to huge blood blisters underneath because of my feet sliding forward due to the aquafor, my left ankle was bruised and unbeknownst to me at the time was swelling from the suitcase I dropped on it, and now my right knee hurt like it was broken in half. This was the deciding moment for me. Was I going to DNF my first 100 miler, my first race of my life or was I going to push through and do it?? I did some soul searching while hobbling forward and said to myself that I was going to get there some way or another. I tried to start running again and it worked. I was actually in less pain running than I was walking. I believe it was at this point near the 80 mile mark that I started talking to myself outloud, signing songs or at least just singing the melody, and just plain yelling nonsense. I also would take the occasional squirt of water directly to my face to get a jolt of energy–like a smack to the face. I must have looked like a madman! A couple of interesting things occurred at night time, I had some mini hallucinations and I was also a bit worried at times about being hit by a car or falling off a bridge. Due to the dark and my headlamp being the only source of light in some places, I mistook some very large low-lying leaves on a plant as an alligator. It definitely put me on alert the rest of the race. Everytime I heard some rustling in the plants near the water I kept looking for one. I would even scan the bushes with my light trying to see if I saw reflections off of animal eyes like they do in documentaries on National Geographic. While trying to pick targets down the road, I once thought a street sign was a runner up in front of me. I changed my mind about 3 times before realizing it really was a post with a sign. As for the cars, due to the fact we had to run on the small shoulder of the road, there were several times where the oncoming traffic going 55mph+ got too close for comfort. I was worried that in my weakened state that I might take a misstep and go into traffic. Crossing some of the pedestrian bridges, I noticed that the barrier was barely hip height. Again, I thought that if I take a tumble or trip, I could easily flip over and into the water. YIKES! From miles 80-90, I saw Butch and Michael a couple more times but I seemed to be getting out of the aid stations and exchange points a little faster. I think around the 85 mile mark was the last time I saw them. They were both in some pain and needed some stretching and regrouping. When I got in front of them from that point, I sort of used it as motivation to keep me going. My target practice method was in full effect as well. I would pick objects down the road like a building, a street sign, or a stoplight to run to (about 1 km away) and then I’d see if I needed a quick walk break of 150 meters. I also met an extremely inspirational runner along this stretch, Jason Romero. The first time he passed me, I noticed he was with another runner but what was different about this situation was that Jason had a sign that said blind runner. He has severely reduced vision essentially giving him a small little tunnel of sight in front with zero peripheral vision. He would follow the light of the guide runner. Everytime he passed me over the miles remaining, he’d be very supportive and positive. I was amazed and motivated by his positivity–especially this late in the race. I came to find out that this man had run all over the world and even represented the United States in the Olympics in London. AMAZING! From miles 90-100 it was more of the same, I would meet my wife, get more water/food and I started using some caffeine sports gels every hour at this point, too. If the next meeting point was a 1.5 miles or less, I’d run all the way until I saw her. If it was further, I’d run about a 1.5 miles, walk for 150 meters, and then run until I would see her again. I also started looking back quite a bit to see if any runners were closing in on me. My competitive streak was starting to take effect. Instead of having any runners to catch, I just wanted to make sure no one would catch me. At the 95 mile mark, my wife left me to go wake my daughters and mother-in-law. It really did my spirits well to know I was going to see my daughters soon. My oldest daughter Fiona was so excited about this race and had even run with me some while I was training. Keep in mind she is 4 years old so having that much enthusiasm touches my heart. When they saw me for the first time around 2:00am in the morning, they were going crazy with excitement. I gathered my new water and ice, gave them a kiss and started walking a little bit before my running commenced. My younger daughter Gianna said, “Daddy you have to run not walk!” I smiled and said okay here I go. We met again with 2 miles remaining. They again were cheering. I left them and at the final exchange point I didn’t stop and told them just meet me at the end, Daddy is running all the way. I didn’t stop running until I reached the finish line. There it was, the moment I had dreamt about for years. My family cheering me on, fellow runners cheering, and everything rushed through my head…with the final thought that I DID IT! All my hard work, dedication, desire, stick-to-it-ness, whatever you want to call it, paid off. 20 hours and 28 minutes from the time I started I was at the end. When I crossed the timing area and gave my chip to the time keeper, I immediately went back to my family grabbed them all and we crossed the finish line together hand-in-hand. Without my family, especially my wife, none of this would have ever even been a dream let alone possible. I felt pretty good considering the undertaking. I didn’t feel like collapsing. My feet were a wreck from blistering but my muscles and legs themselves felt pretty darn good. For my first race of my life, I was pleased but I know I can improve quite a bit with refined training and strengthening. The next day I also learned that I finished 8th overall. After researching all the runners who finished ahead of me, I found out that all are very accomplished runners. 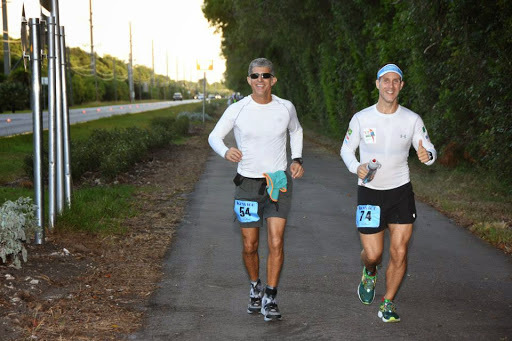 They run all over the planet and in some of the most fabled Ultra Marathons such as Western States Endurance Run, Badwater 135, Marathon des Sables, and 4 Deserts. I received plenty of positive feedback from some of these runners who said I did great for my race of my life let alone my first 100 miler. I thought at the time it was casual chatter but came to realize after the race that maybe with a whole heaping ton of hard work, I might be able to have some success in Ultrarunning! I’ll make sure to follow what I normally do prior to my long run training and definitely not do anything different race day. The lubricating the bottom of feet was a terrible mistake. I will give myself a little more leeway on my heart rate in the beginning to account for early race adrenaline. I will make sure to have two water bottles: one with Tailwind and one with pure water. When blisters arise, I will tend to them right away to avoid the pain factor I dealt with for 17 hours. I will make sure to get the Garmin in the correct mode for a 100 miler prior to the race. In hot races, I’m going to use ice much earlier rather than wait to nearly overheat. Great read and congrats on your first race and first 100 m! Remarkable that you did all that training on your own with no races for motivation in the build up to 100 m. Best regards. Thanks Mike. I hope to make this one of many. Now that I got my feet wet so to speak, I have plenty of new goals and challenges to set for myself. Hope to see you out there some day!